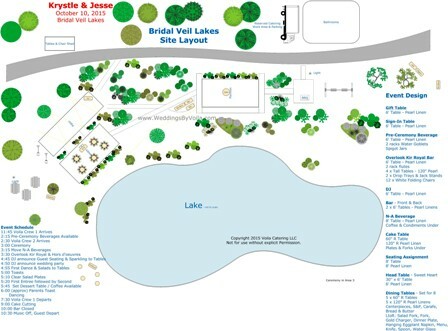 With guests coming from around the country for their Bridal Veil Lakes wedding, Krystle and Jessie needed experienced full service catering and events company to plan their destination wedding especially when they were only going to visit Portland twice from New York before their wedding. 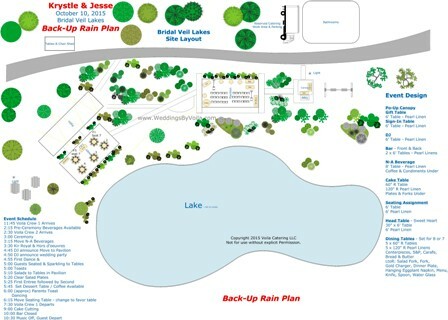 With over 80 weddings at Bridal Veil Lakes, Voila Catering is uniquely experienced to plan the rentals, beverages, service staff, logistics, layout and provide amazing chef-prepared seasonal menus….always cooked on site for the premium food experience. 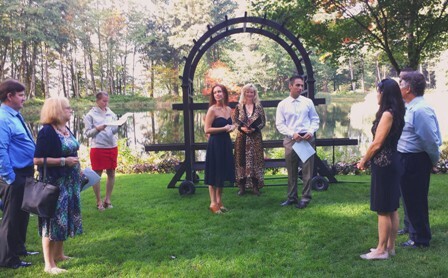 Looking forward to a perfect day, we developed a wedding plan based upon good weather with a ceremony by the lake and dancing under the stars. 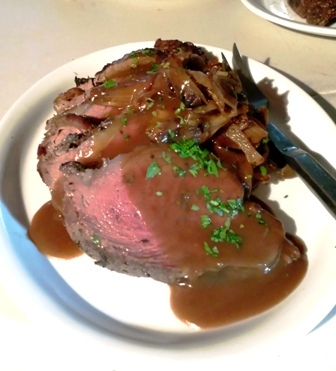 Seasonal custom menu all cooked on-site by our chef team! Exec. Chef Tamara developed a custom menu just for Krystle and Jessie to show off the wonderful Fall ingredients native to the Pacific Northwest. Forest foraged Chanterelle Mushrooms, Red Garnet Yams, Brussels Sprouts, Butternut Squash, Golden Beets, Hood River Pears, and Hazelnuts from local sources were all featured in the menu for the out-of-state guests. 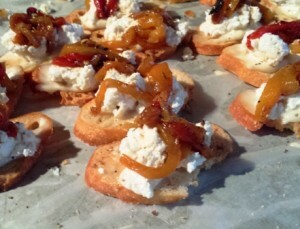 The chef team of Voila Catering cooked everything at Bridal Veil Lakes for the unmatched catered food quality. Krystle and Jessie selected to have passed hors d’oeuvres during the social period followed by a family style dinner. 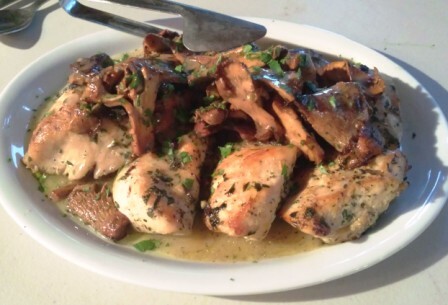 With many of the immediate family member being vegetarian, a special plated vegetarian meal was also served during dinner. 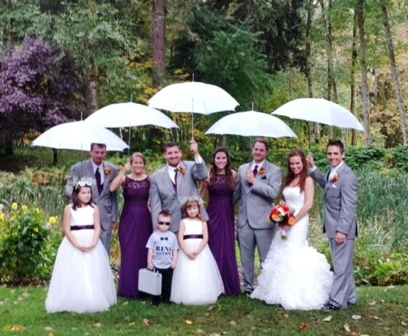 With a family friend doing the ceremony, Krystle and Jesse added our optional wedding coordination services from Weddings By Voila. Marcy and Jonathan led the rehearsal on the Thursday before the ceremony at Bridal Veil Lakes. We reviewed all the details and decisions for the event to make sure everything went as expected. 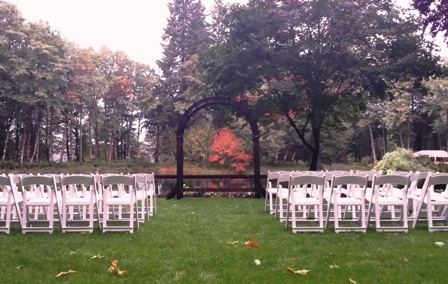 Bridal Veil Ceremony Chairs set by Voila…. before the rain! 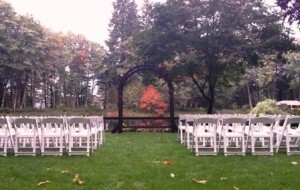 The day of the wedding, our team set the chairs with the backdrop of the beautiful fall tree foliage as planned. However, mother nature had other ideas with a rain storm approaching Bridal Veil Lakes area. Waiting until the very last minute while watching the local radar, our event managers made the call to switch to the rain plan to keep the guests dry and happy. While none of our planner were Boy Scouts, we were ready with the Back-up Rain Plan! 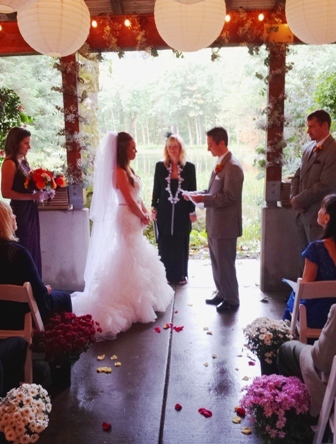 Due to the rain, we moved the ceremony into the Bridal Veil’s Pavilion which we decorated with our lighted white paper lanterns. Set with two rows of chairs for the families, the balance of the guests stood to watch the ceremony with the beautiful background of the lake. With the change in plans, instead of decorating the arch with flowers, our event managers directed the florist to decorate the pavilion and instructed the DJ to setup in the covered area as well. 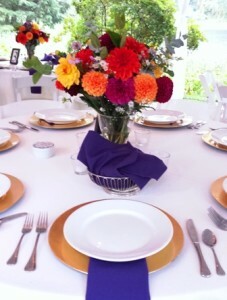 Rentals provided and centerpieces set by Voila! Krystle and Jesse designed the tables with large selection of chargers, 42 colors of linens, table decorations, candle options and flowers from a local florist. Based upon photos of a mocked-up table, the staff of Voila Catering set all the tables as planned at Bridal Veil Lakes! Bride and Groom enjoying the reception and looking forward to dinner, cake cutting, dancing, and starting their new life together! We wish Krystle and Jesse a very long and happy life together! 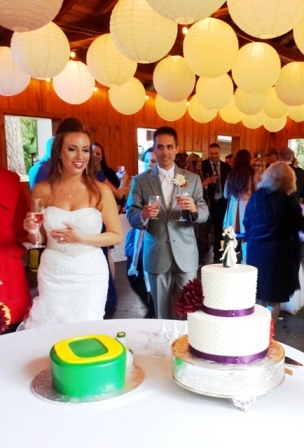 Thank you for having Voila Catering be part of your very special Bridal Veil Lakes wedding!